Today’s review is of a product whose brand I have been seeing more and more in the marketplace lately. 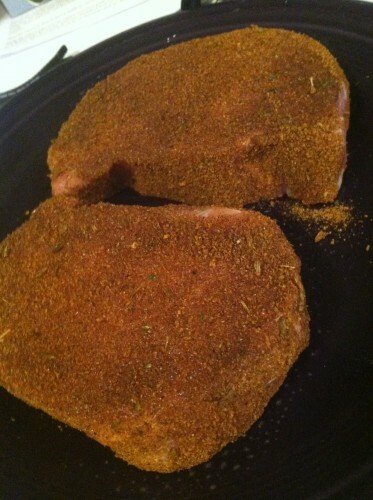 Let’s check out Char Crust® Amazin’ Cajun Dry-Rub Seasoning. 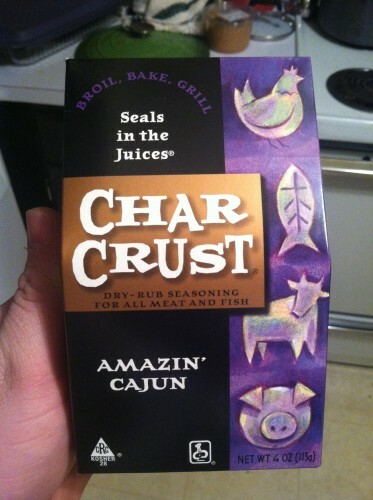 A big thank you to the folks at Char Crust® for sending this to me for review! This line of seasonings got its start in a Chicago steakhouse in 1957 with two flavors — Original Hickory Grilled and Roto Roast. 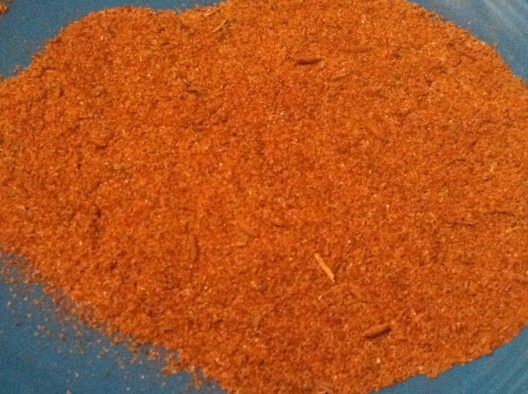 Even after the steakhouse closed 20 years later, the dry rubs continued to be sold to many Chicago restaurants. Today, Char Crust carries 10 different flavors of dry rub seasonings, each of which “Seals in the Juices®”! The ingredient list threw me for a bit of a loop — wheat, cayenne & red pepper, salt, garlic, onion, sugar, spices, celery, Worcestershire sauce powder, mustard, paprika, soy sauce powder, lavender, natural smoke flavor, corn syrup solids, tamarind, natural flavors. It’s the first time I’ve ever seen wheat listed as a dry rub ingredient. The look of the rub is fairly appealing — most of the rub components are similar in size and texture (with some obvious exceptions). When I took a naked taste of this, it was somewhat bitter and really, really hot! In fact, it was really hard to discern any other flavors with the heat being so predominant. Now I love spicy food just as much as the next person, but this seemed a bit one-dimensional. So I decided to try this out on some pork chops. I followed the directions on the box and dredged the chops in the seasoning rather than sprinkling the seasoning on them. Then they went on the grill on top of my ManGrates. I will admit that the chops were quite juicy when finished. However, both my wife and I agreed that the predominant flavor profile that we noticed was straight up heat. She did notice a faint hint of a nutmeg-ish flavor, which I did not pick up until trying the food again sometime later. I was pleased with the crust that the seasoning formed, although I could have gotten a much better crust on the chops cooking them on a flat-top surface such as an iron skillet. The flavors from this particular seasoning were not my favorite — the heat factor was a little too predominant, making this somewhat too one-dimensional. If you’re interested in more info on Char Crust® products, visit their website at http://www.charcrust.com. You can also follow them on Twitter. Big Wayner is the BBQ rub and seasoning reviewer for BBQ Sauce Reviews, and he moonlights as the mad genius behind Big Wayner’s BBQ Blog. He is a KCBS Certified BBQ Judge and enjoys talking all things BBQ! Come check him out at http://www.bigwaynerbbq.com. 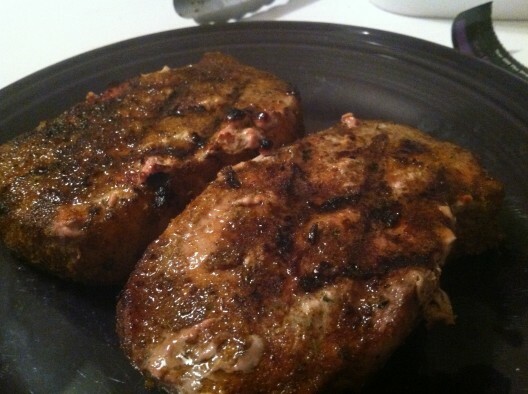 I’m usually hesitant to make pork chops on a grill because they rarely turn out juicy. I’ll certainly give this rub a try. Thank you for the heads up! Nice new site and the pork chops look YUMMYYYY!!! New site looks good, the chops did look good though! U must pay attention to temp… 5 degrees can mean the difference in great and good or bad.